This weekend is the first weekend I am spending in Brussels since the beginning of November. While the weather is no different from what it was four weeks ago (Brussels has a tendency to be equally grey and rainy all throughout November to March), there is no denying that Christmas is close – the strings of lights that now connect the buildings on my side of the street with those across the street were the first telltale sign when I came back from my trip to New York over Thanksgiving. The trip itself was everything I could have asked for and more. I slept more than I had in weeks, I tried out some new exercise classes (it turns out I don’t actually hate spinning and Pure Barre is as hard as everyone says it is) and even found a new pair of glasses. But most importantly, I got to hang with my good friend Michelle who didn’t say anything when I wanted to have dinner at Semilla just because a random photo of one of their dishes on instagram had me intrigued, who was happy to jump on the subway to travel up to Greenpoint in Brooklyn just so we could visit a bakery my friend Sarah told us to seek out and who was equally excited to overdose on caffeine each day just so we could try as many cafes as possible. High on my list of cafes to visit in New York was Blue Bottle, not just for their fantastic coffee I had heard so much about but also for their baked goods, especially the Saffron Vanilla Snickerdoodles. I first heard of these via Heidi’s blog. And when I finally ordered the Blue Bottle Book, it was the first recipe I turned to. Admittedly, I was slightly less enthusiastic about the Saffron Vanilla Snickerdoodles once I tried them – it might have been an off day, but the cookie we tried was pretty chewy, very heavy on the saffron and had a strong aftertaste of baking soda – although, having developed a bit of a weakness for saffron-flavoured anything, I am still keen to try the recipe from the book. That being said, I kept on thinking about Snickerdoodles even after we left. While not a cookie I grew up with, I am fascinated by the idea of a rather plain cookie that is rolled in a flavoured sugar before baking (the Blue Bottle version, as Caitlin admits in the book, isn’t in fact a traditional Snickerdoodle as it is the cookie itself that packs a punch of flavour and there is no extra dusting of sugar involved) – so many possible variations, including this Chocolate Garam Masala version! These cookies take their inspiration not just from the Blue Bottle Saffron Vanilla Snickerdoodles but also from some Chocolate Curry and Coconut cookies we saw at Baked the day we were leaving. While Garam Masala has found its way into granola, cookies and even a couronne in this space, it had yet to be paired with chocolate. And now that I have tried it, I am not sure what took me so long. It turns out chocolate is the perfect canvas for garam masala – it tames the slight earthiness and savoury notes of garam masala (thanks to cumin and coriander which are typically included in the spice mix) some might find odd at first in sweet preparations. This is the third post in my “Goes well with Coffee” series here on the blog and these Chocolate Garam Masala Snickerdoodles fall firmly into the “Chocolate-like” aroma spectrum. These cookies, although not tooth-achingly sweet are rather large (something I came to like while we were in New York where every cookie we tried alongside our numerous coffees was roughly the size of the palm of my hand) and one is the perfect size for those 4pm hunger pangs. If possible, given the bold chocolate flavour and the subtle spice from the garam masala, I would eat these alongside a Turkish coffee – a coffee as rich, dark and bold in flavour as these cookies. Notes: These cookies are very straightforward to prepare. The two things to bear in mind (and this applies to all cookies made with chickpea flour): do not try the raw dough (raw chickpea flour tastes leguminous in the worst possible way) and, for the same reason, do not underbake the cookies – you are looking for crisp edges and a cookie that is nicely puffed up in the oven but that buckles within a couple of minute of being taken out of the oven. In a large bowl, beat the butter together with the raw cane sugar, the light brown sugar and pinch of salt until fluffy (3-5 minutes). Add the egg and beat to combine. In a separate bowl whisk together the chickpea flour, cocoa, pinch of salt and baking soda. Add to the butte mixture in one go and beat to incorporate. Cover the bowl and place in the fridge to rest for 1h. While the dough is resting in the fridge, pre-heat the oven to 175 degrees and line a sheet pan with parchment paper. In a bowl mix the remaining sugar together with the garam masala. Using an ice-cream scoop drop tablespoon sized cookies into the spiced sugar. Roll each cookie in the sugar to coat before placing it on the sheet pan, leaving a couple of centimetres of space between the cookies. Bake for 17-20 minutes or until the cookies have puffed up in the middle and are crisp on the edges. Leave to cool for ca. 5 minutes before moving the cookies to a cookie rack (the cookies will buckle and firm up as they cool). these Chickpea Flour Gingersnaps (I may or may not increase the ginger hit by folding some crystallised ginger into the dough as well). I love using garam masal in baking, particularly in combination with chocolate. It’s such a lovely fragrant spice. These cookies sound like such a wonderful use of it too. Thank you Kathryn! It is such a unique flavour in sweets, ist it? What else have you baked with garam masala? Ooh la la!!! Sophia, these sound SO GOOD!!! And your trip to NYC sounds so fun!! Traipsing through all the coffee shops and bakeries = heaven. I mean, except for the sub-par cookies, but since they led to these…not so bad right? 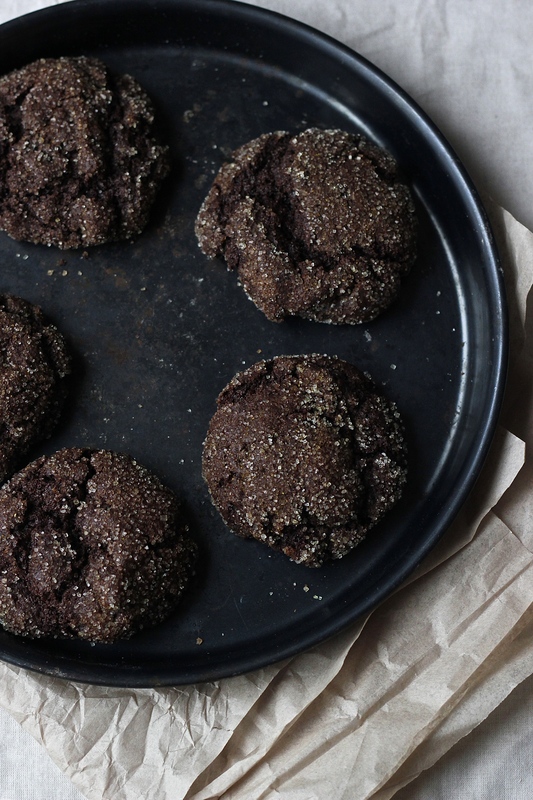 Love the idea of these deep, dark, chocolate-y cookies laced with warming spices! I’m tempted to try these tonight for a cookie gift package! Thank you Erika, you are really the sweetest! And yes, NYC was so much fun! !